This beautiful beach house is right across the neighborhood street just steps from the huge 12,000 square-foot lagoon pool. The porch and balcony are both huge wraparounds, and they are spacious – both running the length of the home furnished with rocking chairs and adirondack chairs for your enjoyment. 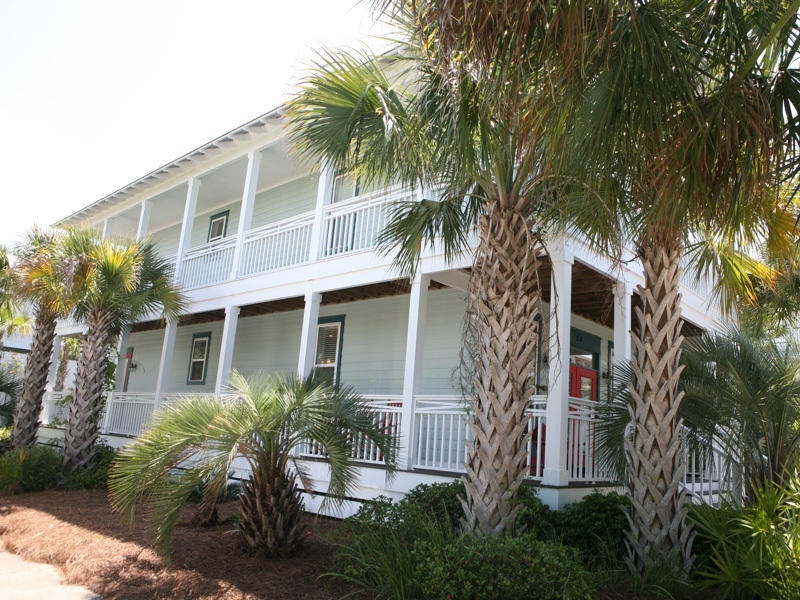 Newly furnished and professionally decorated, you will love this upscale vacation home in Seacrest Beach North. Only about 100 steps from your doorstep to the lagoon pool entrance!! The following are a few more details about this beach house. Sea La Vie is on a large corner lot which is more private than many of the other homes. The home has 4 high definition flat screen LCD tv’s. 2 DVD player’s, one blue Ray, and playstation 3. Starz movie channels and 12 mega bit wifi are also available. In addition, the home has luxury towels and linens, sateen sheets, luxury pillow top mattresses, designer bedding, and upscale furniture. Ground floor includes a spacious open floor plan with 12 ft ceilings throughout, with a living room, dining room, kitchen with granite countertops plus guest bedroom with king bed. A hallway full bath with tub/shower combo is also on the first floor. The first floor guest bedroom and living area adjoins the wraparound porch. On second floor there is a large master suite with a king bed and adjoining bath with double vanity, tub with shower and large separate shower with two shower heads. French doors adjoin to the spacious wraparound balcony from the master suite. Another guest bedroom with king bed is on the 2nd floor with private access to wrap around porch plus a bonus room considered a fourth bedroom area that has additional sleeping accommodations (two, 3-person bunk beds twin over full) and a flat screen TV. A full bath with tub/shower combo adjoins the second floor guest bedroom and bonus room/bunk room. Take a pleasant stroll along the palm-lined boulevard to the beach 3 blocks away or ride the free shuttle service that will pick you up right at your home during peak season. Enjoy the nearby shops and Restaurants at Rosemary Beach and the Village of South Walton right next door all within walking distance. (3 blocks to center of Rosemary Beach) Sea La Vie is a corner lot with own private driveway with parking in driveway and next to home. Sea La Vie is right next to community green space where your children could run freely and play while you are watching from the large wrap around porches. A 7-night minimum stay is usually required during spring break and summer. Minimum stays are also usually required over Labor Day, Thanksgiving, Christmas, and New Year’s. Pets and Smoking are not permitted. To book this property now and avoid the VRBO fees, please call Glori directly at (770) 685-6888.